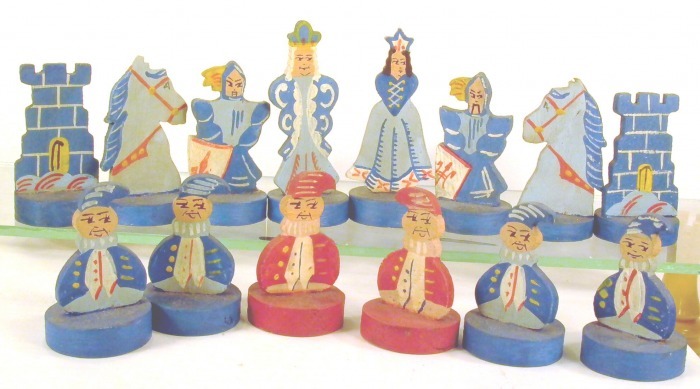 Finely painted cottage industry silhouette set of yesteryear - these jigsaw-cutout figures were very popular in former times. 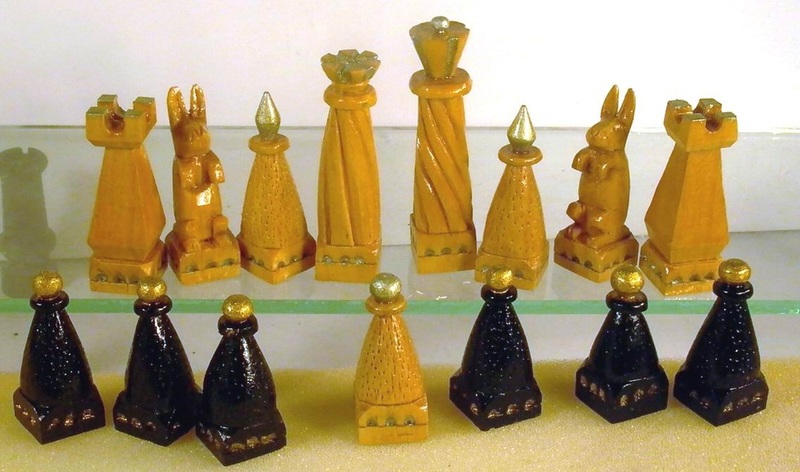 Could be as old as early 20th, but probably dates to second half of the 20th C.
Entrancing folklore set, with rabbit knights. Small size (king 68 mm), lots of little details speak of home craft. 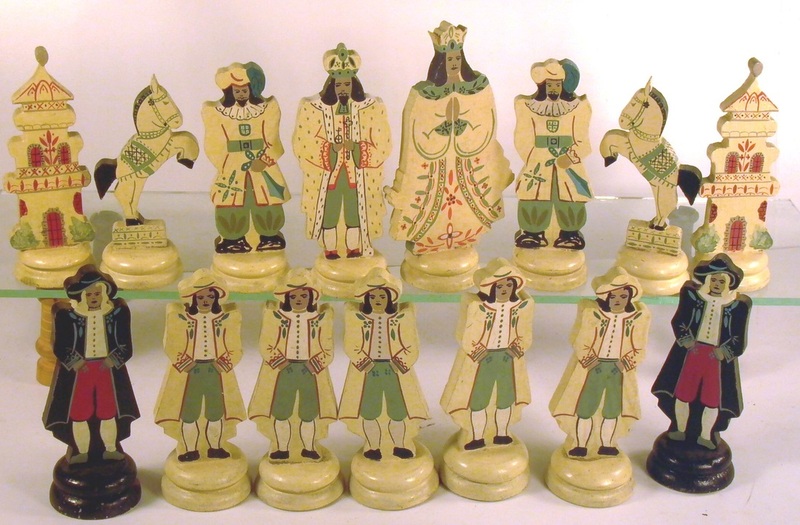 Knight in german means "hopper" - but this set is most likely from Russia, where the word "Kon" designates the knight. 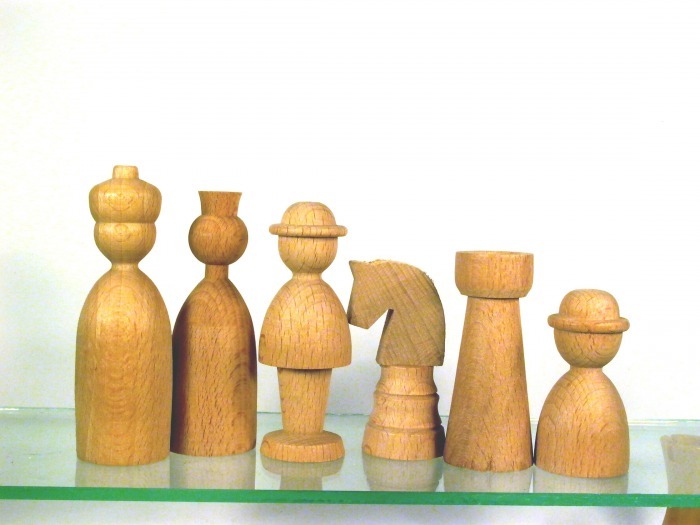 Also means "hopper"? 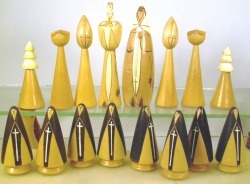 Any comments? 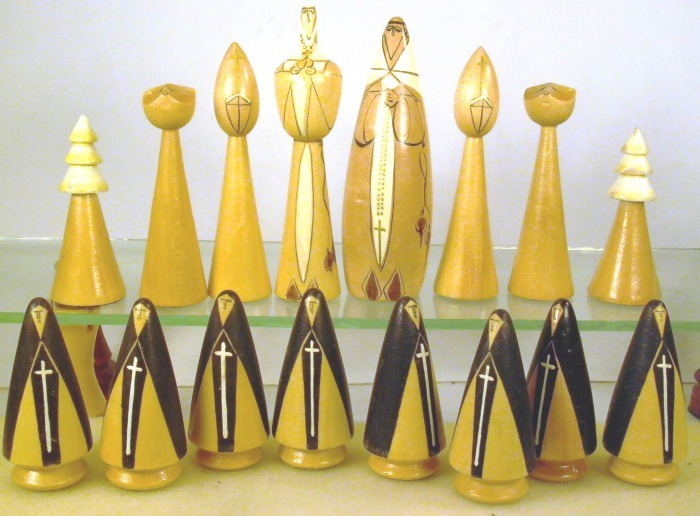 Handpainted set from Japan, lampooning the catholic hierarchy - bishops, mother superior, clerics. 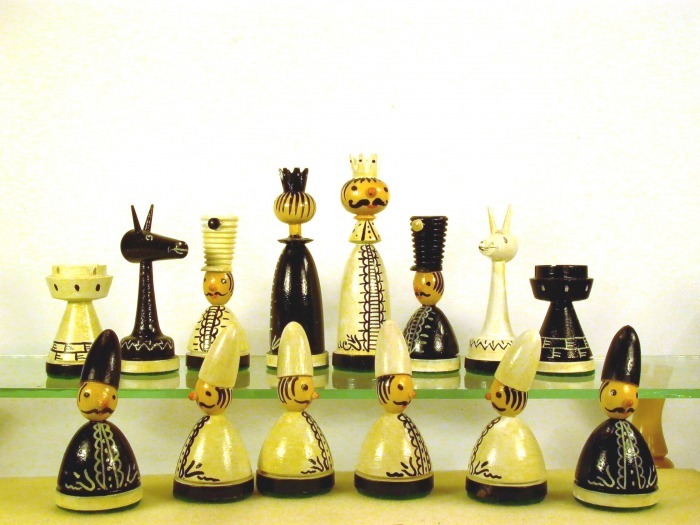 The knights are highly stylized cats - and the rooks pine-trees. Kings stand 102 mm - this set looks done by a professional workshop, possibly on the basis of prepared wooden kits ..
Nicely coloured set, probably home industry from Germany in the 60ies - kings stand 86 mm high. 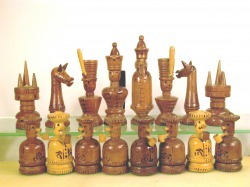 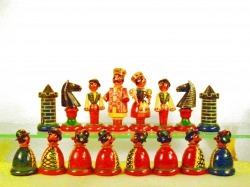 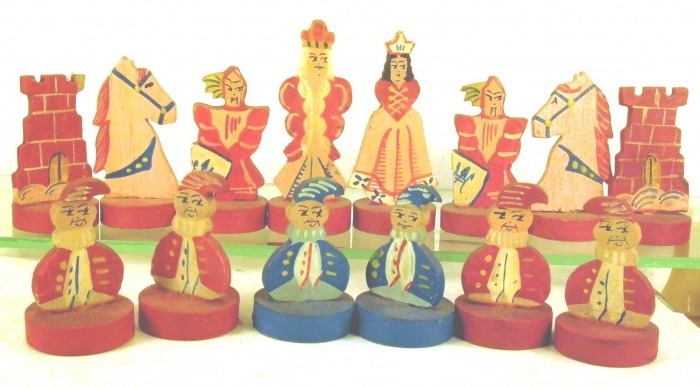 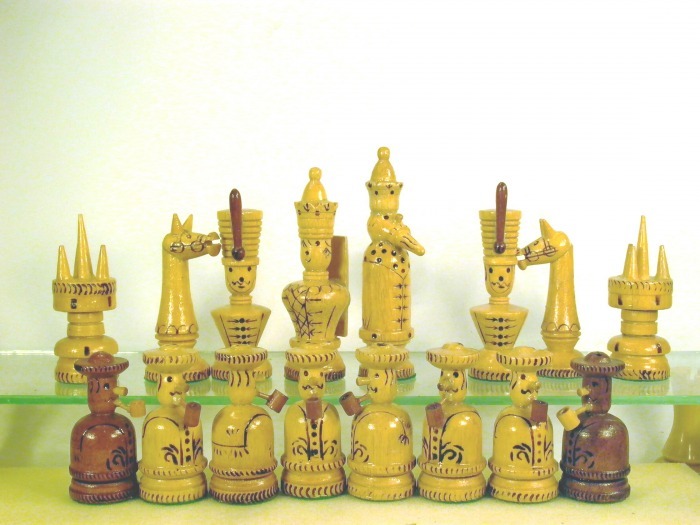 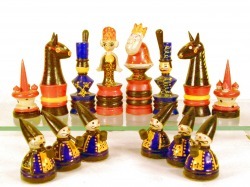 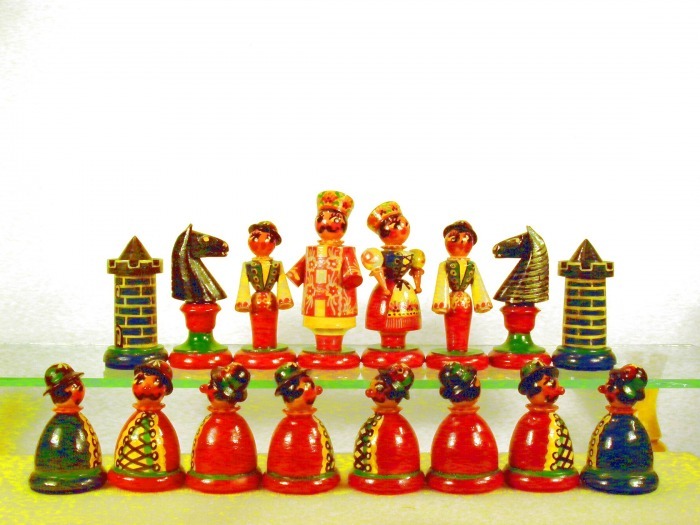 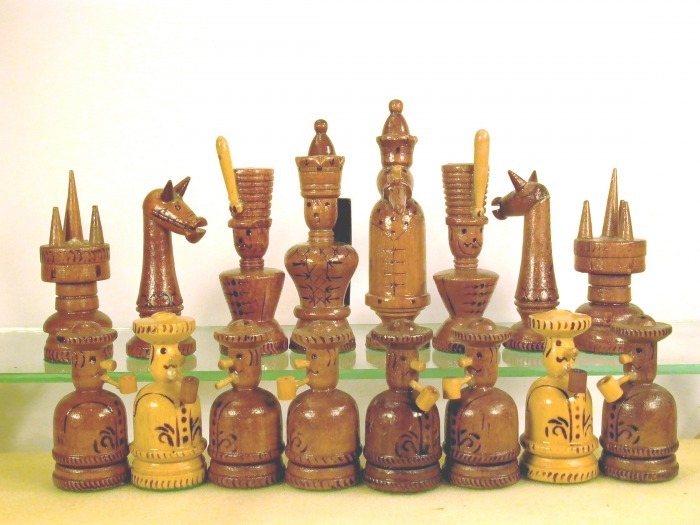 Made in Taiwan in the 60-70ies - composed of numerous wooden parts, painted - king stands 122 mm. 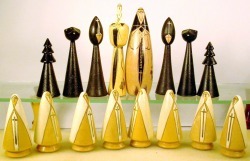 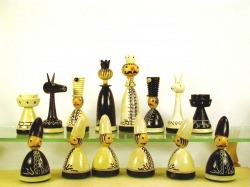 Standard presents from Russia through the postwar years. 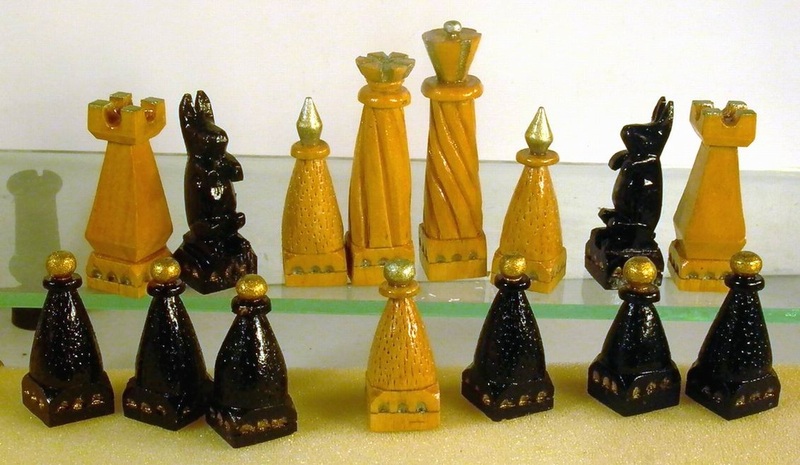 Quite attractive sets, handpainted. 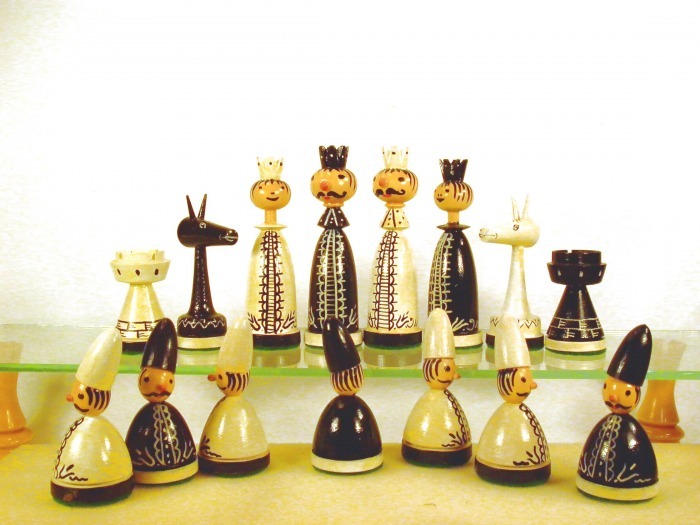 Handpainted in great detail, this souvenir set form the 60ies is usually billed to be from Hungary - it might well be ... painted in Hungary! 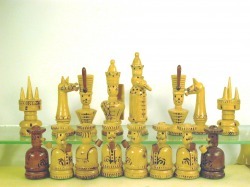 Kings stands 79 mm, the pieces are again assembled from a lot separate parts...nice set. 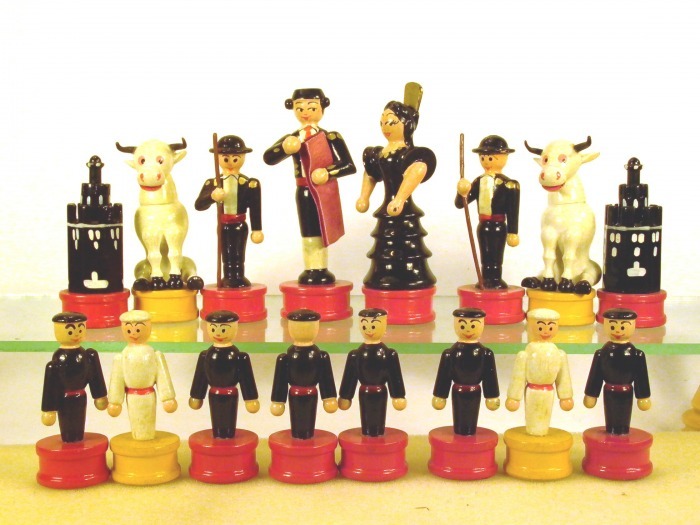 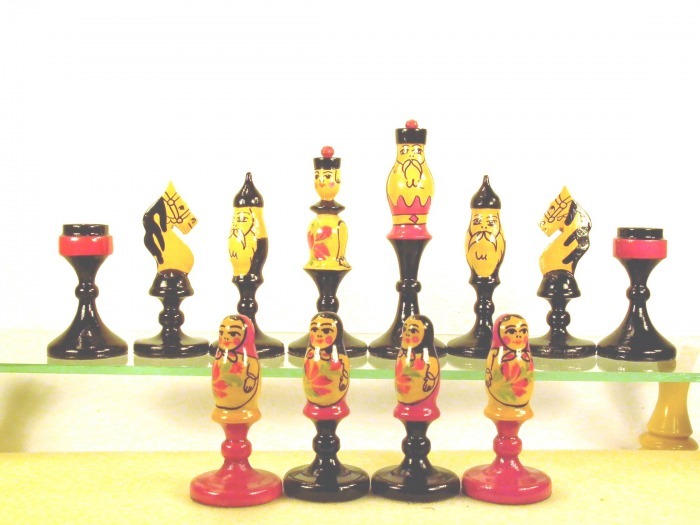 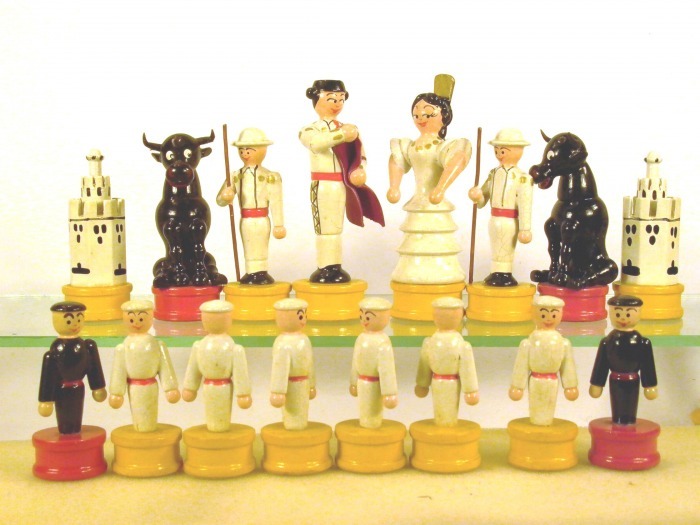 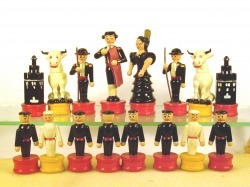 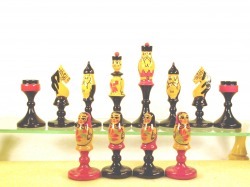 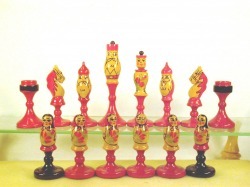 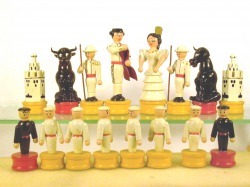 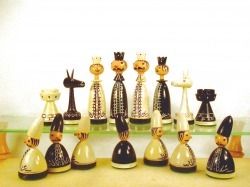 Lovely souvenir set from 50ies Sevilla - assembled figurines, lovely detail in painting - king stands 86 mm. 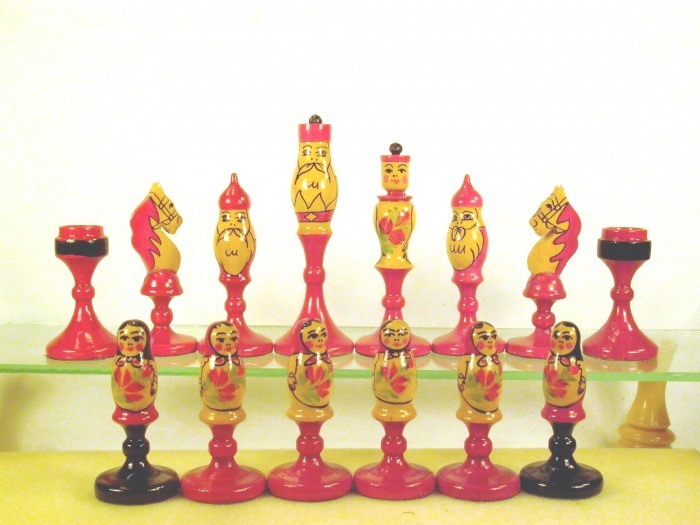 Czech Toy - or Check Toy ? 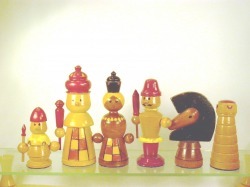 Toy handpainted set in Czech costume? 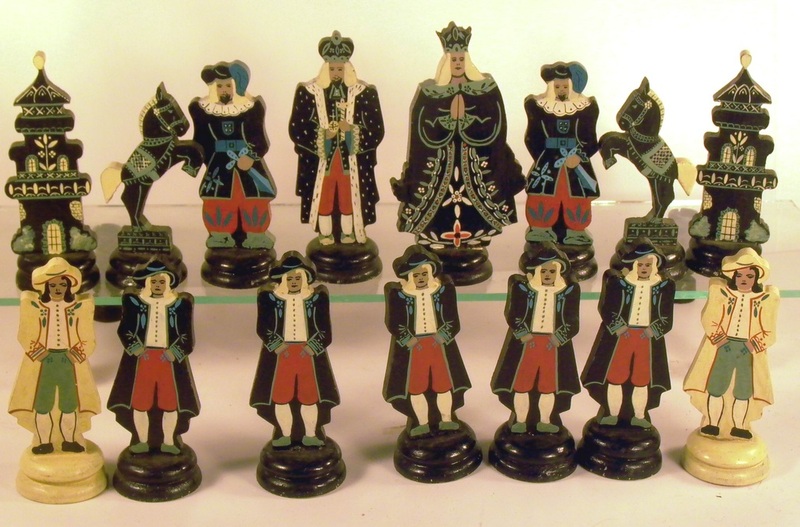 - these used to be sold as souvenirs all over Czechoslovakia - but see above - kings stand 78 mm - 60ies to 70ies ? 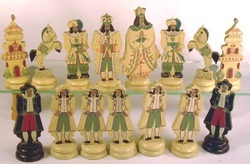 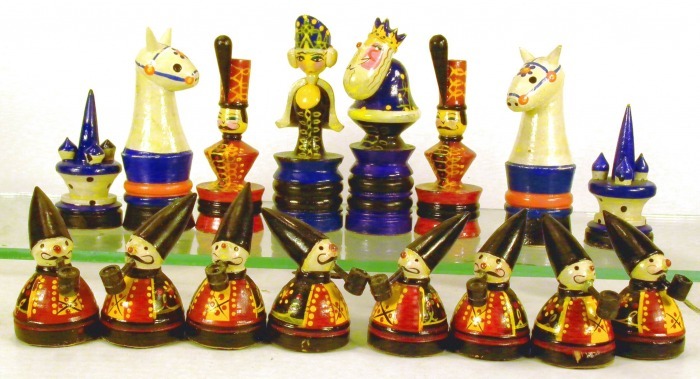 In a slightly different style - donkey knights - these set are reputed to originate in the Czech part of the Erzgebirge - kings stand 95 mm, this set was sold in an elaborate cassette by A.v. 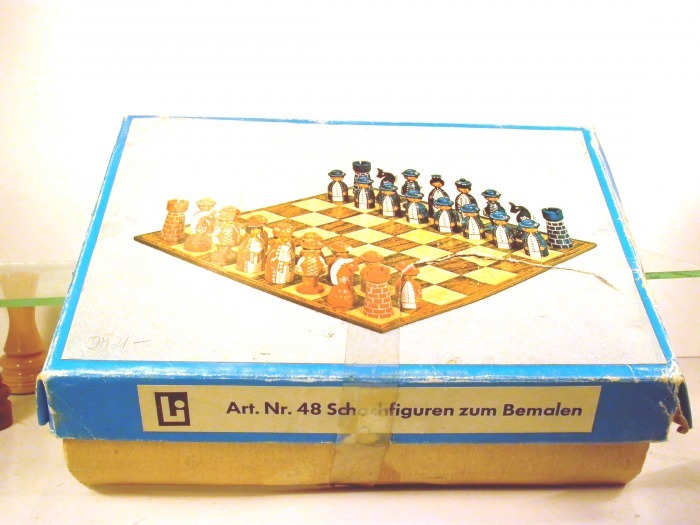 Rolland , Berlin - 60ies.